(Bloomberg) -- The garden city of Singapore wants to be even more green. It also wants more homes in its central business district, and plans to move facilities underground to free up living space. As part of the plan to rejuvenate Singapore’s central area, a variety of homes and amenities in areas such as downtown, Marina South and Rochor will be planned so more people can live near workplaces, the city-state’s Urban Redevelopment Authority unveiled in a draft master plan Wednesday. 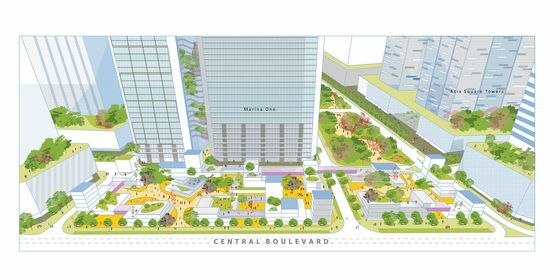 There will also be about 1,000 hectares more parks and park connectors, and it’s hoped that in future, more than 90 percent of households will be within walking distance of a park. The plan foresees that more utilities, transport, storage and industrial facilities will be moved underground to better free up surface land for people-centric uses, and the government plans to tap 3D technology to help in the upfront planning of such space. There are also new housing concepts that include creating more “one-stop hubs” to make it easier for residents to shop, dine and engage in family bonding activities under one roof. Improved transport connectivity at major hubs in Singapore’s north, west and east is an additional feature.